Hell hath no fury like a horny Harry. Daniel Radcliffe delivers another standout performance. It’s just a shame that despite his best efforts, this film should go back to the fiery hole it came from. Anyway, enough Harry Potter jokes. Let’s get down to business. I would rather watch Radcliffe rap in that weird American accent for two hours than endure this turgid affair again. We get straight into the luvvy duvvy guff with Radcliffe and Temple cuddling up in their loveshack; a taddy old treehouse in the middle of some dreary woodland. The pair have good chemistry but it’s all a little tame and dreadfully slow. That is until the incident. It literally flicks forward with Ignacious Perrish (You read that right. If you find that ridiculous, I haven’t even started) being accused of his beloved’s murder. Radcliffe certainly plays the part well and I thought he mastered the American accent quite well. If you can get over that rapping cameo on the Jimmy Fallon show. As Ig attempts to piece together his girlfriend’s murder, he suddenly wakes up very horny (Come on, stop it). Yeah, he has horns. Some lazy plot device about turning away from God and being claimed by the Devil. Blimey, if everyone did that, I’d be seeing all sorts of horny folk (Okay, let’s it). I understand that this was adapted from Joe Hill’s gothic novel. This film certainly didn’t make me want to read it. I can accept a level (well, a degree) of fantasy and exaggeration but it goes from dead pan serious to flat out ridiculous. And that’s the problem, the tone very much like the story line is . . . all over the place. And by the time, it makes a decision. It’s over or you’ve lost interest. 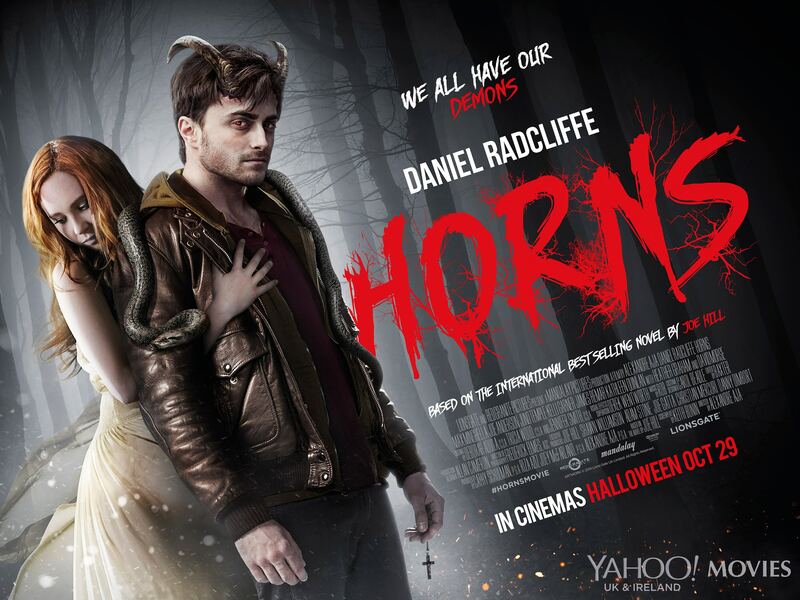 The horns were just plain weird. The fact people start acting strange. From telling the truth to performing their darkest desires stretching from a girl scoffing a box of doughnuts to a dentist banging his nurse to a comatose Ig. Some of the confessions are comical (An old lady fighting the urge to tell an annoying toddler to shut the front door, for example). While other moments just fall flat on their arse. A scene making some lazy commentary on the news media could have been done so much better. Their initial truth telling comments were eerily realistic but the all out royal rumble in the dirt was just farcical. What infuriated me is that while I was trying to get my head around the whole horn thing. The only thing that kept me intrigued while this film churned along then goes and flashes back to when the star crossed lovers first met as kids. It was incredibly corny, predictable and just plain dull. In the first ten minutes, all the characters pretty much spoon fed you their origins and then we have to see it? Why? It was only when we got to see the last few encounters before Juno Temple’s untimely demise that it got a little more interesting. A little. Her role was completely wasted, to be honest. A shame. What really disappointed me was that the whole devil angle wasn’t really used until the last 30 minutes. The last 30 minutes of a two hour film?! In that last half an hour, things finally kicked off (At last) with Ig embracing the darkness with a scaly necklace in tow. Busting out the old Parseltongue to his slytherin’ companions and unleashing the horny avenger. But in between that, we had to endure predictable red herring murder mystery BS and surreal moments that had a hint of Twin Peaks . . . On crack. Director Alexandre Aja (The Hills Have Eyes/Mirrors) had a good supporting cast at his fingertips; David Morse (The Green Mile), James Remar (Dexter), Max Minghella (That British douche from The Internship) and Heather Graham. They do their best to lift their flat and uninspiring characters. Graham and Minghella stood out particularly. Joe Anderson (Across The Universe/The Grey) was also pretty good as Ig’s brother. But all the finger pointing and flicking about led to the same old end result. It was so obvious who it was but the how did catch me out . . . A little bit. The jazz music interludes did my nut in. What was the point of them? It seemed every time I got interested in a scene, Aja and writer Keith Bunn would throw in something that would kill the tension or disrupt what was a good scene. And the finale? Well, what a Keiwaste of time. Ol’ Harry turns into a badass devil and all he does is mope, scream and get beaten up . . . a lot. It was unbelievably flat. A couple moments of dark humour and crafty special effects does not a good movie make. Radcliffe certainly carries the film with all the charisma he can muster. But not even his magic can work on this. It just seemed to produce more plot holes, more questions and by the end you couldn’t care less. If you’re a supernatural or Radcliffe nut, give it a go. But otherwise, the power of Christ compels you NOT to see this film. In the words of Kevin Sorbo’s Hercules . . .